Without performing regular pool maintenance, your above ground pool will develop an unhealthy level of dirty-looking and uninviting water. Not to mention the fact that forgetting or ignoring the necessary cleaning of the water in the pool will have a negative impact on the pool’s equipment. In spite of the fact that all pool owners are well aware of these facts, most of them do not have the time to tend to their above ground swimming pools. Consequentially, the performance and integrity of the pool is impacted severely, sometimes to the extent that the pool cannot be used after a few months. 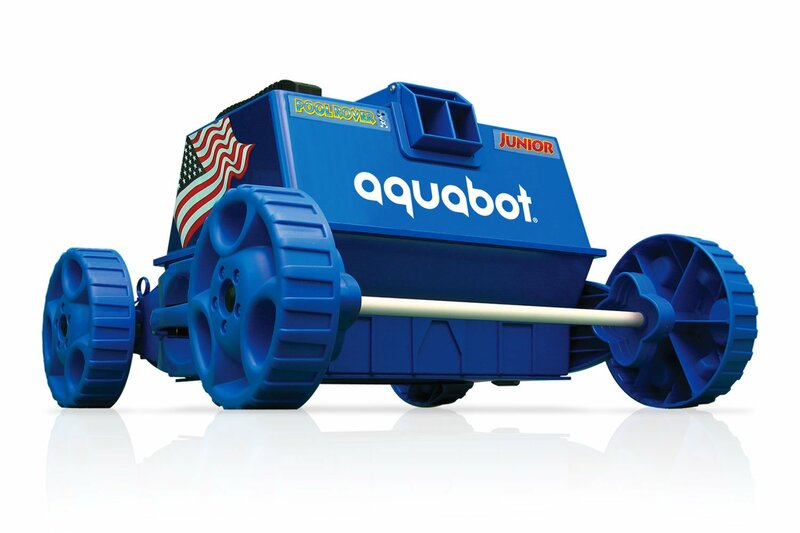 For those of you who simply do not have the time to perform pool maintenance on your above ground pools (or just grew tired of it), there is a solution: the APRVJR Aquabot Pool Rover Junior. Robotic Above-Ground Pool Cleaner. As you probably guessed from its name, one of the cleaning products which is the latest above ground pool cleaner innovation, courtesy of Aqua Products. Designed to handle any shape and size of pool, this pool cleaner, ensures an efficient functioning of the filtration system as well as prolongs its lifespan. But that is not the only thing that deems this automatic pool cleaner as a must-have device for above ground swimming pool owners, as you will discover from this guide. The APRVJR Aquabot Pool Rover Jr. Robotic Above-Ground Pool Cleaner is among the most appreciated cleaning products on the market. The numerous satisfied customers have awarded it with a relatively high rating, meaning four of out five stars. Even the most advanced pool cleaners with hoses present several major drawbacks. First of all, in order to clean your above ground pool they will need to operate the filtration system for longer and you will have to employ their help more often. In addition, the frequency of changing the filter media is rather high and you will still need to treat the pool’s water with the necessary chemicals. In short, the pool cleaners with hoses cost you more time and money. At this point, I believe we can agree that the main advantage of owning a pool cleaner comprises of the fact that it will take on all the hard work you normally have to do around the pool. However, if you want to continue to enjoy the spare time, it is necessary that you check its condition before and during usage. Before you panic, take note that this task will not take too long (simple observations) and implies checking the suction capacity and the cleaner bag. The best way to test the suction is when this automatic pool cleaner is already in the water: simply take place your hand below the surface of the water, right underneath the cleaner. If the suction feels weak, then it is most probably due to the presence of a clog or it means that the cleaner bag is full. If you let Rover clean the bottom of the pool with a full bag, then expect to see debris behind it. Are you tired of spending all your summer weekends pool cleaning up and preparing a safe, alluring environment for your loved ones? Does pool maintenance eat up all the free time from your already tight schedule? To make our pools clean, we need also have pool care. Then, perhaps it is time to check out one of the ground breaking innovations in above ground pool cleaning, the Aqua Products APRVJR Aquabot Pool Rover Jr. Robotic Above-Ground Pool Cleaner. Durable, resilient, efficient and versatile – this is your pool’s best friend!